Points start to become precious in Champions League groups to decide who will lead the group at the end of the qualifying round. The confrontation between Zinedine Zidane and Mauricio Pochettino has kept its promises, with a good game from the two opponents finishing on a justified draw (1-1). Although the match was controlled by Real Madrid, it was the Londoners who scored the first in the 27 minutes with an own goal from Raphael Varane because of a really good cross from Serge Aurier. After this goal, nothing really changed in Tottenham minds but after a hazardous tackle, Serge Aurier offered Cristiano Ronaldo to come back with a penalty. Real Madrid began the match with a young player as right-back with Achraf Hakimi instead of Daniel Carvajal for whom the season stopped sharply after his heart problem. The 18-year-old, the first Moroccan wearing the white shirt, played very well with a lot of runs on the right side bringing some support to the attack. The rest of the team was as usual, with Casemiro as sentinel with Toni Kroos, Luka Modric and Isco in front of him, Cristiano Ronaldo and Karim Benzema in the front of the attack. For Tottenham, the squad was very different from the weekend against Bournemouth, with a strong team, 5 at the back, with Fernando Llorente associated with Harry Kane in the front of the attack, letting Christian Eriksen alone with Moussa Sissoko and Harry Winks behind comforting the defensive base. It was not difficult to predict how the opposition will turn. Real Madrid played at a slow pace, keeping the ball with some brilliant passes to cut the defence. The danger came mainly from Achraf Hakimi and Luka Modric. The first one not really played as a right-back but more as winger, helping the midfield not really used to playing on the wing. For such young player, it was a very good performance, underlined by Zinedine Zidane at the end. He had a lot of opportunities to cross, but most were not dangerous and well managed by the London defence. It will be interesting to watch the evolution of this player and see how Zidane will handle the problem of the right defender. In the midfield, it was Luka Modric who played the best with a lot of awesome passes and his usual vision. Like he did for Croatia, which was a must win against Greece to go to the 2018 World Cup, the little Mozart played very well, always trying to go forward. He was not helped by his teammates, including Cristiano Ronaldo who was not very prominent in this game. Only Isco was good to breach slowed down moments, and bring some problems to Tottenham’s defence. Looking at passnetwork is also interesting while squad scheme seems to be a 3-4-2-1. It shows the importance of Achraf Hakimi, who was alone on the right side. Cristiano Ronaldo didn’t touch a lot of ball and Karim Benzema’s position (or Isco) could explain the difficulties for Real Madrid to find some breaches into Tottenham defence. With his defence made of Serge Aurier, Davinson Sanchez, Eric Dier, Toby Alderweireld and Jan Vertonghen, Mauricio Pochettino came into the Santiago Bernabeu with a strong team, moreover with Moussa Sissoko and Harry Winks into the midfield. Like Real Madrid, one key was the right-back. Serge Aurier, who is a real motorbike able to run for all the game – both in attack and defence – thanks to his incredible stamina. He was key because he was at the origin of the Varane own goal but he was also the player who caused the penalty just before half time. This is the main defect of Serge Aurier: can be very good in attack but irregular in defence. Nevertheless, if the idea of putting Moussa Sissoko above him was good – Pochettino may have wanted to contain Cristiano Ronaldo – the French midfielder could not help his defender. The choice to put Moussa Sissoko on the field was questionable due to the low level of Moussa Sissoko in this position (and generally) compared to Moussa Dembele (absent) or Victor Wanyama. As a symbol of this solidity, Hugo Lloris may have saved his team, stopping very dangerous balls, including a very impressive save at the hour. 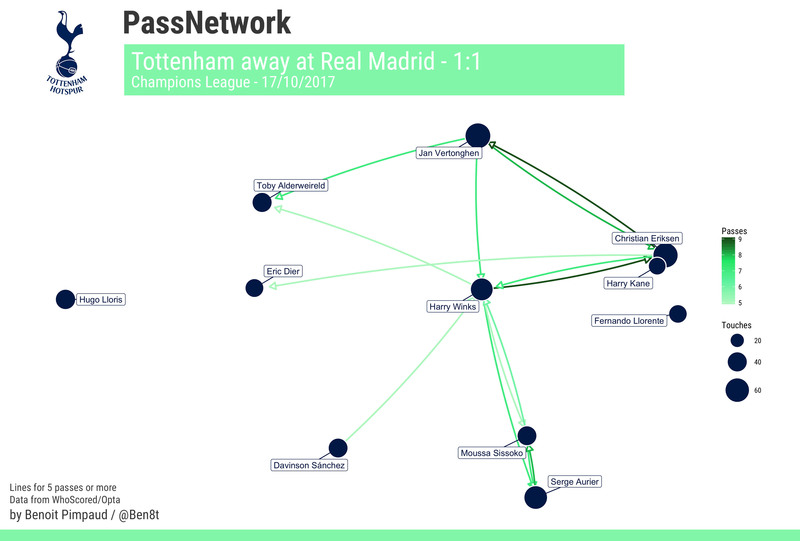 Passnetwork clearly shows inefficiency from the Tottenham right side, too defensive to worry Marcelo. With almost nobody to play the game in the middle, passes stayed lateral with some efforts to find Christian Eriksen and Kane: not really efficient against one of the best defences in Europe. At the end of the game, Mauricio Pochettino was probably happy with a draw against Real Madrid. His tactic was very smart: Tottenham have a level still very far from that of Real Madrid, moreover, they do not have a great experience of European matches, so playing defensively was the only good solution to take maximum points at the Santiago Bernabeu after a good match against Borussia Dortmund. The Tottenham side could dream now to finish first in group H. For Real Madrid, this is a game that will not be remembered. It may have demonstrated the tactical limits of Zinedine Zidane, and recall that he is still a young coach.